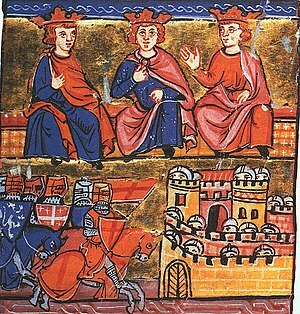 2nd_Crusade_council_at_Jerusalem, Conrad III, Louis VII and Baldwin III (Photo credit: Wikipedia) I was looking at my Slideshare account. There I have three presentations on Spiritual or Religious abuse. They have been there 9 months or less and they have had over 1600 hits, and are continuing to build fairly rapidly. I know that for some of you 1600 hits is not a lot. But these are not posts for having chiseled abs. These presentations are not pictures of flowers and small furry animals with inspiration saying overlays. These are presentations about people who have been abused in their spiritual setting by spiritual leaders/mentors who were supposed to be interested in doing God’s work, which includes Christlike caring for these people. Kind of a bummer of a topic. I get a few hits on topics on religocentrism or historical methodology of missions (and other topics that lack that certain pizazz) and get nothing like 1600 hits. I am left with a belief that these numbers on poorly advertised presentations from an (admittedly) obscure compiler suggests that this topic is a BIG concern. Oh sure, it could be that the hits are from fully secularized individuals who, to feel good about their god-free life choices, like to look up pages on people who have made different choices and suffered for them. I believe that most of the hits are from people that are people of faith (or people who were of faith) who have been hurt by those who were called to help. Many of these abusers were created not born. That is, they did not start out as abusers, or abusive. They may have even started out as sincere individuals. But they became part of a flawed structure or hierarchy. The hierarchy may have been of their own creation, but the initial intent of the structure was not to abuse. Saying the problem is “sin” is too simplistic. Not that it would be wrong to say the problem is sin. But sin is always with us, so we aren’t addressing the problem in a meaningful way. It seems to me that we lack a good theology and methodology for dealing with the issues of Power and Control. Many Christians I have talked to seem to have a 16th century perspective of power and control. If one has the power to control, and the right to control, one must control without limit. I have come across this in terms of God. If God is all powerful, and God has the right to control all things, then it is logical, to some, that he MUST CONTROL all things. Of course, this is a complete fallacy. The power to control and the right to control does not necessitate the desire to control. In Ecclesiology we see it as well. We see the Apostles (the Twelve) given power and authority. Commonly, we draw the somewhat logical(?) conclusion that the Apostles did in fact control the church. This does not appear to be true. The apostles set up the Church of Jerusalem, but did not appear to rule it. James the half-brother of Jesus appeared to be an early (the first?) senior elder/ bishop/ overseer/ presbyter/ pastor of the church of Jerusalem. Even the one time the Twelve seem to exercise extensive ecclesiastical control in the Universal church (the Jerusalem Council in Acts 15) they appear to merely be senior voices of a common developing consensus. Paul, despite his acerbic moments, appeared to rarely if ever control and only occasionally emphasized his authority. His focus was almost always to persuade with words and encourage churches to be guided by the Spirit of God. On the other hand, it does appear to me, at least, that St. Ignatius in the early 2nd century did have a view of church leaders as being those who should exercise a high level of control in their churches. However, even there, the fact that Ignatius kept writing letters to this effect to churches suggests that this was not the common attitude and/or belief and/or practice in the churches at the time. There is often the presumption that “too many cooks spoil the soup.” One needs one creative vision to make things happen. There are certain examples where this has been true. Yet it seems to me that evidence points to more failures than successes of this philosophy. Even organizations where a strong controlling visionary leader was faithful to the end often are ill-equipped to handle the chaos of transfer of such control and power after the leader is gone. The Bible notes the value of having many counselors, noting the limits of a king to rule wisely without such help. Samuel cautioned even the very idea of .having a king. In church this cautious note is often interpreted as Human Monarchy versus Theocracy (a battle between two autocratic systems). But, in fact, the system of government before the ascendancy of kings was fairly decentralized. Moses was fairly autocratic (though even here, the story with Jethro provides a caution to the wisdom of not having some some decentralization of control) . Joshua was also fairly autocratic, but after this such control went away. We like to look at the book of Judges as a time of chaos (when there was no king and everyone did what is right in their own eyes) but I see little evidence to suggest one should take this period of time to evidence the benefits of centralizing of power and control. The words of the major and minor prophets seem to reject such a simplistic view. Today, some churches combine power and control within the same person or persons. This often breeds abusive situations. Often the argument is that it increases effectivity. The vision of one (presumably getting his or her vision from God) is given the control to effect that vision. Again, I believe we see the problems in many churches where alleged effectivity is given priority in decision-making. In healthy secular organizations and in healthy governmental systems, checks and balances are put into place to limit the accumulation of an inordinate power and control in one location or person. The Caesars (Julius through Trajan and Hadrian) may have made Rome great(er) but they also set up governing precedents that weakened the empire in the long-term. In missions, there are a growing number of books (such as by Glenn Schwartz in “When Charity Destroys Dignity: Overcoming Unhealthy Dependency in the Christian Movement”) that provide caution of missions exercising a considerable amount of power and control in the mission field. They provide many examples of the problems that come from that. The biggest one tends to be Dependency. A. Separate power and control. In public corporations, the power is in the hands of the shareholders. They dole out power and authority to the Board of Trustees. These, in turn, dole out power and authority to those who actually control the organization on a day to day basis. This separation of power/authority and control provides a check/balance to those who run things. Government does this as well. In representative democracies, the power is in the hands of the people and they dole out such power to representatives. These representatives (in the legislative side) dole out power (commonly money) and authority (legislation) to the executive (control) part of government. In congregational churches a representative democracy also exists where the power is in the hands of the people, while the control is in the hands of a council or board. The members of the church empower the leaders but also provide a check for their control. B. Change our attitude about power. Jesus spoke a great deal (especially in the Sermon on the Mount) about effecting change while eschewing traditional forms of power and authority. The Sermon on Mount is counterintuitive. One can understand the triumphalism of Eusebius of Antioch at the conversion of Emperor Constantine to Christianity (and the legal power and prestige gained for the church from this event) after centuries of degradation and powerlessness. Yet with hindsight we can see that it was a mixed blessing. The Cross and the Sword, or the Church and the Sceptor have issues that we as a church STILL have not fully come to terms with. Many churches find “Power” a popular topic. Some have the entertaining trait of the overemphasis of the word in prayers and sermons (POWWWW-errrrrrrr!). Power encounter is a popularized method of missions. But history (most recently confirmed in the growth of the disempowered underground church movements in China) seems to show that the church that Jesus set up has been most effective dwelling and acting from a position of weakness. I doubt this is the final thoughts on this topic… but it is a start (and one has to start somewhere).